- March 15, 2017 : Debate on the outcome of the 9-10 March European Council and discuss the “Rome declaration” on the 60th anniversary of the Treaty of Rome with Council President Donald Tusk, Commission President Jean-Claude Juncker, Malta’s Deputy Prime Minister Louis Grech and Italy’s Prime Minister Paolo Gentiloni, who will address the plenary for the first time since he took office in December 2016. - Amended proposal on the "waste package"
Postmarked in Strasbourg "Session of European Parliament" (France) dated March 15, 2017. 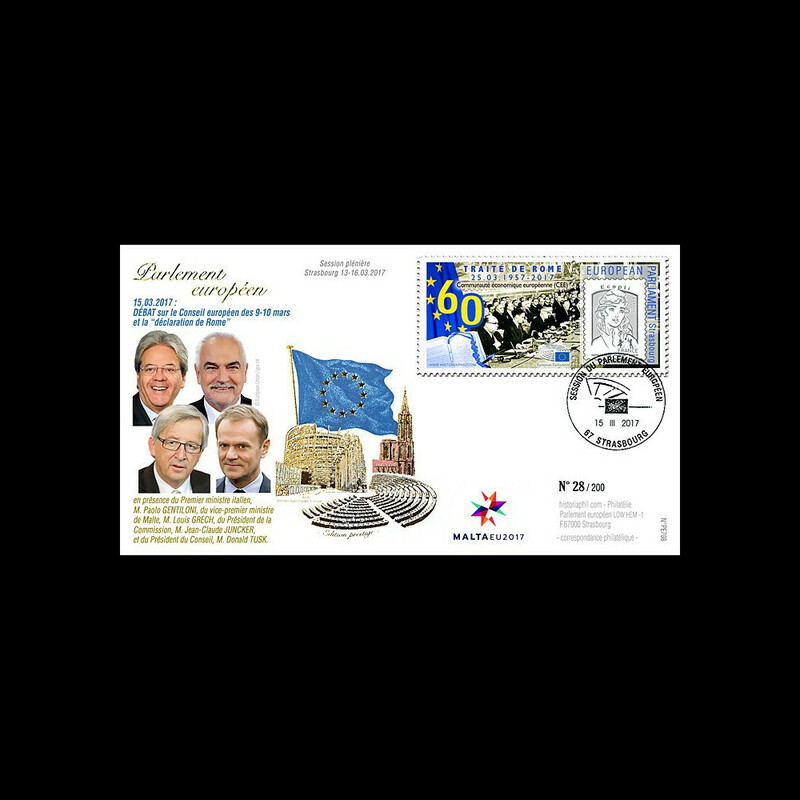 PE530 : 2007 Germany FDC "Berlin 50 years Treaty of Roma / Merkel & Chirac"
PE604 : 06.2011 - FDC EP "The Greek Debt Crisis - Mr. Juncker, President of the Eurogroup"
PE605 : 07.2011 - FDC European Parliament "Mr. TUSK, Polish Presidency of EU"
PE609 : 2011 - FDC European Parliament "EUROZONE, JUNCKER & BARROSO & VAN ROMPUY"
PE611 : 12.2011 - FDC European Parliament "End of term of Pdt Buzek and Sakharov Prize"
PE663 : 07-2014 - FDC European Parliament "Election President Commission - JUNCKER"
PE669 : 01-2015 - FDC European Parliament "70 years Liberation of Auschwitz Birkenau"
PE671A : 2015 - Maxi FDC "Republican Walks - WE ARE ALL CHARLIE / Press Liberty"
PE665 : 10-2014 - FDC european Parliament "New European Commission of JUNCKER"
PE674 : 04-2015 - FDC European Parliament "70 years Liberation of Concentration camps"
PE682A : 07-2015 - FDC EP "Greek referendum NO / Tsipras in the European Parliament"
CE67-IIA : 04-2016 - FDC Council of Europe "Mr. JUNCKER, President European Commission"
CE67-IIA-PT : 2015 - Set 5 Marianne Council of Europe "Mr. JUNCKER, Commission President"
PE706 : 01-2017 - FDC session "Election of European Parliament President Antonio TAJANI"
PE707 : 02-2017 FDC session " CETA / Mr TRUDEAU, Canada & VAN DER BELLEN, Austria "